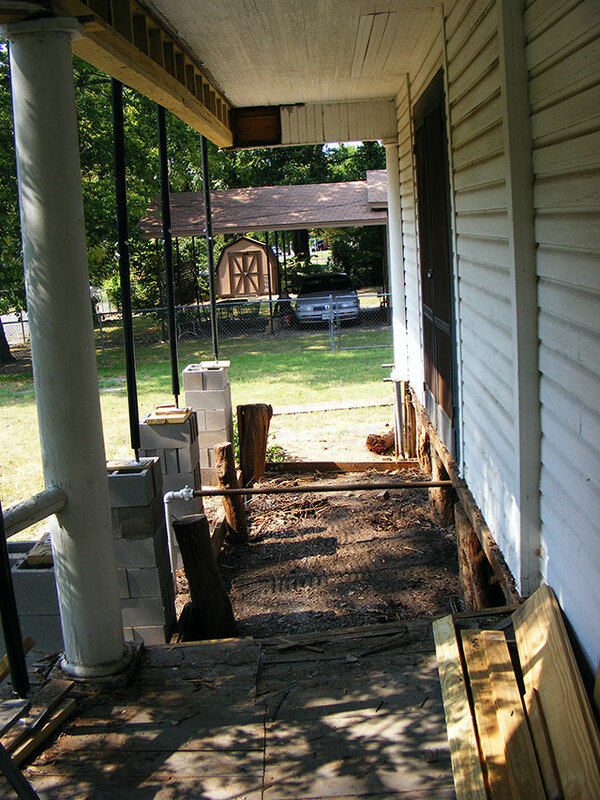 This weekend we got the second segment of porch header installed, and started to work on the porch deck and structure. The first part of the project is the 20′ straight (as in not deliberately curved…”straight” would be a hard word to apply to anything that was there) section. 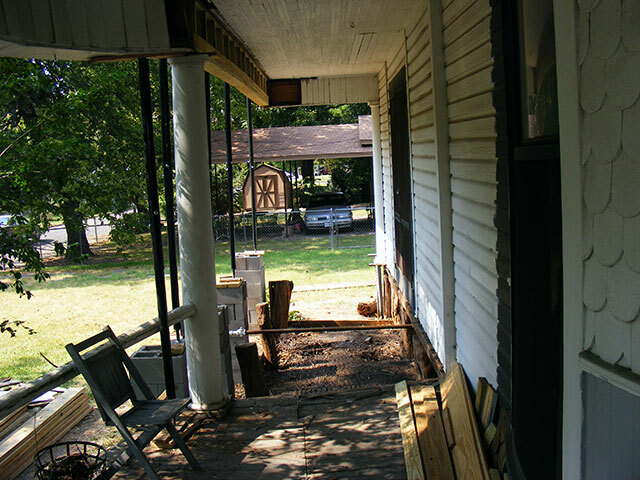 We will address the curved sections of porch in a separate project. Step one: Remove all the rot. Step two: Repair what’s left. Not much left. Note the header is installed. There wasn’t much left after step one. The intermediate supports…20′ 2×8’s. the notched one was originally sitting on two posts, but one of the posts had fallen out, and it was no longer supported on either end. The other beam was attached at both ends, but had NO support in the entire 20′ section. 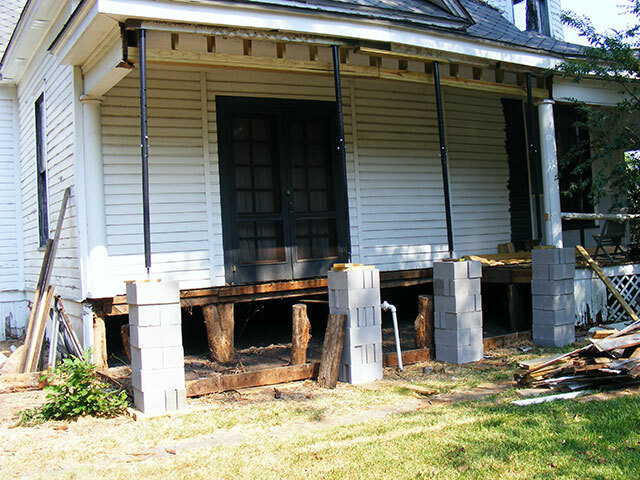 No wonder this porch was a bit…bouncy. 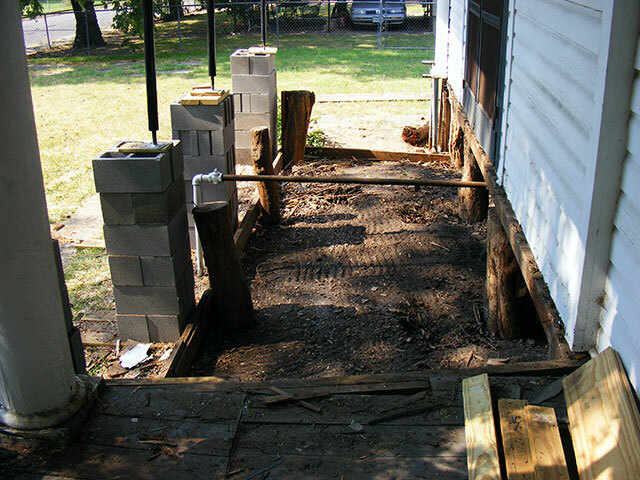 I will reuse these for intermediate supports for the porch deck, but will add additional blocking. 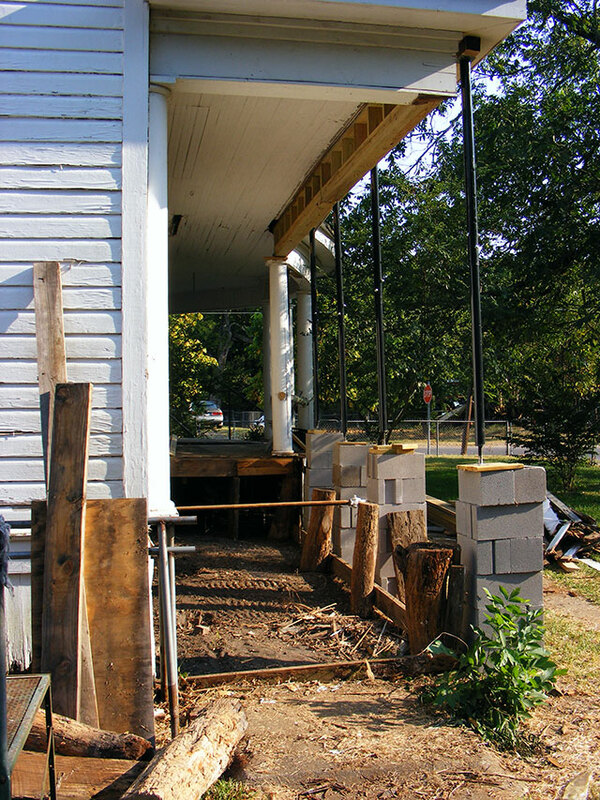 The front beam (that the columns rested on) had been cribbed on a couple times but was basically completely rotted. This was actually pretty easy to get apart, I needed nothing more than a hammer and a Stanley Wonderbar. 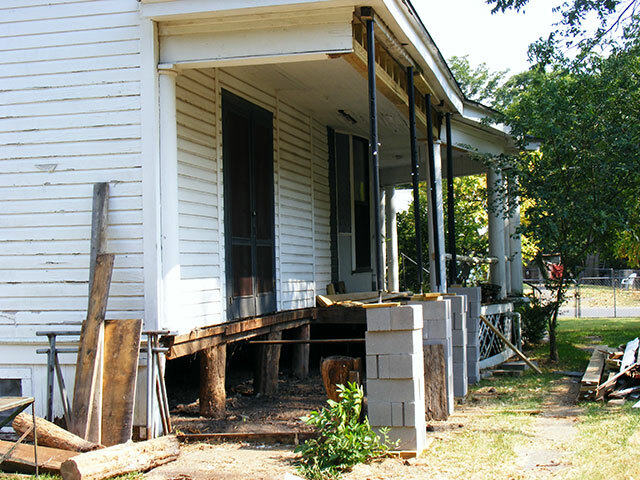 The front beam or porch sill, will be three 2×8’s bolted together and run the length of the straight section, and also under the 1st column at the edge of the curved section. Additional blockage/support will be added. I will also add one more intermediate support. The old ones were on 2′ centers…which is just a little wide for tongue and groove flooring, although it worked for many years in this case. We should get this framed up this weekend. The flooring is on order. 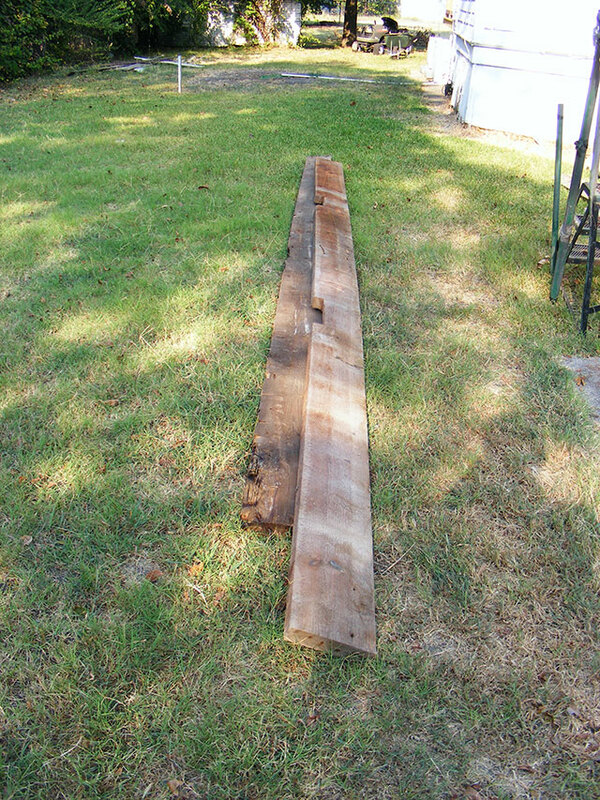 The flooring we are using is a 3″ tongue and groove like what was originally here, except it has been treated for rot and bugs, and then kiln dried. Nice stuff. Not cheap. I *MAY* actually have it far enough apart. Tune in next week…when (hopefully) I get to start putting stuff back together!